Greek Cavalry–This picture shows how holding weapons while riding limited the soldiers’ abilities. The Greek cavalry, or hippeis, played a major role in the battlefields of the Peloponnesian War. It was an important characteristic that brought Sparta success. The war lasted from 431 to 404 BC. It took place in mainland Greece, Asia Minor, and Sicily. Athens and Sparta both used cavalry. Thucydides believed “the growth of the power of Athens, and the alarm which this inspired in Sparta, made war inevitable” (Strassler 16). The war started all because of a desire for power. The horses were very useful in combat. They made traveling easier, and soldiers became comfortably accustomed to riding them. During periods of resting time, they dismounted, and as soon as attacks rose up again, they would “leap easily upon their horses” (Worley 84). 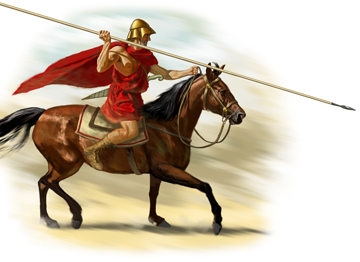 One tactic the Athenian cavalry employed was the use of javelins. They threw javelins at the enemy, and controlled the movement of the whole army. They could throw the javelins while going forward or retreating. Cavalry also fought in “close quarters” (Gaebel 96) to the enemy with lances and swords in addition to javelins for farther distances. Some disadvantages came with the cavalry. Hands are occupied while riding a horse, so the rider is not able to carry as many weapons. They ran out of ammunition quickly. Also, throwing javelins from horseback decreases the efficacy of the shot. Accuracy and distance decline (Sidnell 58). Their cavalry was well-used in observing and attacking when raids occurred. Unfortunately, they soon became overworked. Horses became lame and wounded, and had no time to rest in between battles (Worley 119). The cavalry was powerful and made up for the times when others’ attempts failed. They stepped in and dominated. For example, the Chalcidians utilized their hoplites, light troops, and peltasts, and then the cavalry. They “at last caused a panic amongst them” (Strassler 137). Their strength in “riding up and charging them just as they pleased” provided victory against Athens. Gaebel, Robert E. Cavalry Operations in the Ancient Greek World. University of Oklahoma Press, 2002. Shumate, Johnny. Greek Cavalry. The Lost Treasure Chest. Sidnell, Philip. Warhorse. New York: Hambledon Continuum, 2006. Print. Strassler, Robert B., ed. The Landmark Thucydides: A Comprehensive Guide to the Peloponnesian War. By Thucydides. 1996. New York: Free Press. Print. Worley, Leslie J. Hippeis. Boulder: Westview Press, 1994. Print.